Balmoral Show 2017 saw the introduction of a fourth day, meaning the addition of a host of new classes. Bluegrass Horse Feeds were delighted to undertake the sponsorship of the New Team Schools Show Jumping Championship. With qualifiers for this final taking place throughout Ireland from towards the end of 2016, the best 13 teams in the country fought it out in the prestigious main arena on the Saturday of the show. The jumping was incredibly competitive, with some blisteringly fast rounds on the clocks. In the end Banbridge Academy took the inaugural trophy, narrowly snatching the victory from The Royal School Armagh. 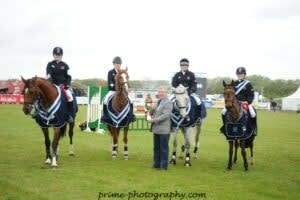 Bluegrass Horse Feeds would like to congratulate all the teams who qualified, and special congratulations to Alex Finney, Ellie Humphries, Ella McCallister and Charlotte Eakin on taking the victory. Bluegrass thank all the schools for their support and we look forward to next year’s qualifiers and final.